ʻEnaʻena means "red hot," perhaps in reference to the hot coastal habitat of these plants. The early Hawaiians used ʻenaʻena when they stored their feather kāhili to repel insects. The generic name Pseudognaphalium is derived from the Greek pesudo, false, and gnapalon, lack of wool, in reference to the woolly nature of this species. The species name sandwicensium refers to the "Sandwich Islands," as the Hawaiian Islands were once called, and named by James Cook on one of his voyages in the 1770s. James Cook named the islands after John Montagu (The fourth Earl of Sandwich) for supporting Cook's voyages. 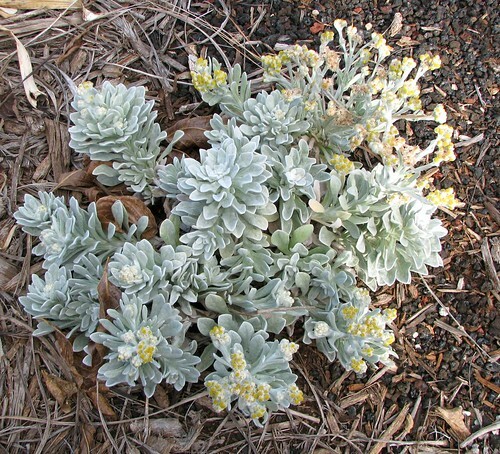 The varietal name molokaiense refers to Molokaʻi, where this species is found on the western dunes of the island.